This week we begin reading the Book of Numbers (Bamidbar), named after the many demographic statistics found within it. The text opens with God’s command to take a count of the Israelites. We read that only those over the age of 20 were included in the census, as this was the age of eligibility for military service (Numbers 1:3). This may explains why there was a need for a census to begin with. After all, we see in other places in Scripture, and in Jewish law, that taking a count of Jewish people is highly frowned upon. If so, why take a census? By telling us that God instructed to number only those eligible for military service, the Torah suggests this was a necessity for the purposes of military organization and planning. The Israelites had to reconquer their Holy Land, and as we go on to read throughout the Tanakh, face off against many foes. Therefore, as with any army to this day, it would have been absolutely vital to know exactly how many soldiers there were. The bigger question here is why are only men over the age of 20 eligible for military service? In a related note, Rashi explains (on Numbers 16:27, based on Sanhedrin 89b) that a person is only judged in Heaven for sins committed after the age of 20. It is only at this point that a person is considered a full-fledged adult, and entirely responsible for their actions. The Heavens are well aware of those hormonal, experimental, rebellious teenage years, and do not hold a person responsible for their actions until they are 20. The Zohar (I, 118b) suggests that the young person will, of course, suffer the consequences of their own poor choices in this world, but will not be judged for it eternally. The Mishnah (Avot 5:22) further confirms that 20 is the age of adulthood, saying that this is the age “to pursue” a livelihood. This Mishnah states that until 20, a young person should be wholly focused on Torah study and mitzvot: at 5, to start learning Scripture; at 10 to start learning Mishnah, and all the laws that this entails; at 13 to start observing the commandments; at 15 to start learning Gemara, and delving further into Judaism; at 18, to get married. At 20, they are ready to enter the real world. The Midrash (Beresheet Rabbah 14:7) wonderfully ties it all together by stating that God created Adam and Eve as 20 year olds. Based on this, it may be reasoned that in the World of Resurrection—like in Eden—people will inhabit their 20 year old bodies, at the peak of their beauty and vitality. The Arizal provides a deeper, mystical perspective (see, for instance, the introduction to Sha’ar HaGilgulim). While we often think of the soul as a singular entity, it is actually composed of several parts. The lowest is called nefesh, the basic life force, common to all living things (at least those with blood, as the Torah states in Leviticus 17:11). The next level is ruach, “spirit”, which encompasses one’s good and evil inclinations, along with their drives and desires. The third and, for most people, highest level of soul is neshamah. This is associated with the mind. A newborn baby is imbued with nefesh, and little else. As it grows, it attains more and more of its ruach, and hopefully has achieved it in full by bar or bat mitzvah age. By this point, a child has learned right from wrong, and understands their good and evil inclinations. It is only at age 20 that a person can access their full neshamah. This is when their mental faculties have developed, and when they can truly overcome their evil inclination. This is why 20 is the minimum age of judgement in Heaven. It is also why 20 is the age of adulthood, and the age at which priests (and soldiers) can begin their service. The Arizal often notes how, unfortunately, most people never really access their entire neshamah. Many are trapped at the level of ruach for much of their lives—constantly dominated by their evil inclination, with their mental faculties never properly developed. These people have never truly delved into their soul, and might end their life never having realized its purpose. Some are not even at this level, and spend their whole life in the realm of nefesh alone, no different than animals (and newborn babies)—entirely selfish, and mostly just instinctual. Such a person has extremely limited mental-spiritual abilities, regardless of their apparent knowledge or how many PhDs they may have defended. This is called mochin d’katnut, which is all a person has until age 13. From then on, they can develop their higher mental faculties, mochin d’gadlut. Only at age 20 can a person access all levels of their intellect (see Sha’ar HaKavanot, Inyan shel Pesach, derush 2). Those who have delved into their neshamah and have attained these higher states of mind are capable of going even further. The fourth level of soul opens up to them, called chayah, sometimes associated with the aura. The fifth and highest level is the yechidah, a sort of divine umbilicus that connects a person directly to God and the Heavens. Indeed, the name “Israel” (ישראל) can be split into yashar-El (ישר-אל), “straight to God”. Every Jew has the potential to tap into their inner yechidah, together with the untold spiritual powers it brings along. A person on this level has access to Heavenly secrets, can receive Ruach haKodesh, a “Holy Spirit” or “divine inspiration”, or even attain true prophecy. In most years (like this year), parashat Bamidbar is read right around the holiday of Shavuot. This holiday commemorates the divine revelation at Mt. 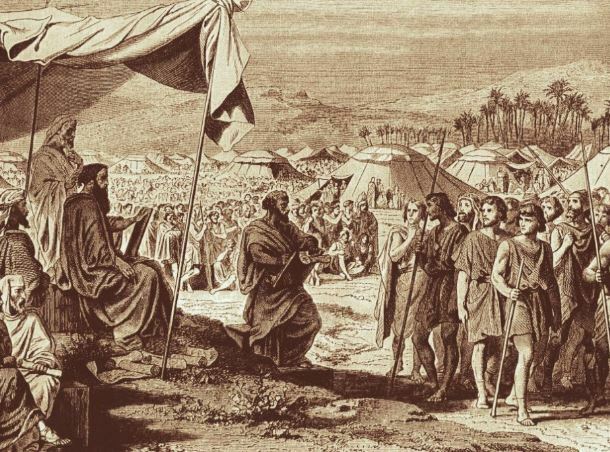 Sinai, an event traditionally compared to a “wedding” between God and Israel. The Torah does not specify a date for this holiday, instead saying that one should count 50 days from Passover. In fact, the Sages call Shavuot “Atzeret”, as if it is the conclusion of Passover, just as the holiday of Shemini Atzeret is the conclusion of Sukkot (yet still a standalone holiday in its own right). While Shavuot is likened to a marriage, Passover is described as a new birth. The Sages see the Israelites emerging out of the split Red Sea like a newborn baby coming out of the waters of the womb. 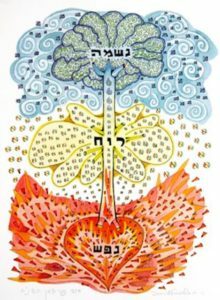 There are exactly seven weeks between the first day of Passover and Shavuot, and each week corresponds to one of the seven middot, the seven “lower” sefirot of the mystical Tree of Life. By putting these ideas together, we can conclude that the transition from the first sefirah to the seventh—from Passover to Shavuot—represents the development from birth to marriage. Fittingly, one can draw a very close parallel between the qualities of these sefirot and the major stages of life. The first sefirah is Chessed, kindness, and is always associated with water. Chessed represents the time in the life-giving waters of the mother’s womb. This is a stage of life that is entirely chessed, requiring no effort on the part of the person at all. They are completely sustained by their mother. Just as the Israelites emerged out of the Red Sea at the end of Passover—at the end of the Chessed week—the embryonic phase ends with birth. This thrusts the person into Gevurah: severity, restraint, difficulty, the very opposite of Chessed. The newborn phase is the most difficult. The baby is unable to express itself, and has no power to do anything on its own. It spends much of its time in pain and discomfort, crying and misunderstood. Every little ache is literally the worst pain it ever felt in its short life. But that phase soon ends and opens the door to a much better world. Early childhood is the easiest time of life. A child has all of its needs taken care of, and spends most of his or her time in play. There is no need to work, study, or struggle. A child is showered with constant affection and attention. They are full of energy, curiosity, and innocence. The third sefirah, Tiferet, is also associated with this kind of youthful innocence. (The forefather Jacob, who embodied Tiferet, is described in the Torah as tam, “innocent”.) Tiferet is “beauty” and it is also known as Emet, “truth”, apt descriptions for childhood. Then comes Netzach: persistence, competitiveness, ambition. This sefirah corresponds neatly to the pre-teen and early teen years, the first half of puberty. The negative quality of Netzach is, naturally, laziness and a lack of motivation—especially common in this age group. But there is also a great deal of competitiveness and a need to win (having not yet learned to lose gracefully). Most of all, there is a sense of immortality (netzach literally means “eternity”), and the carelessness and poor choices that come with that attitude. The second half of the teen years, up until age 20, is when the young person finally starts to mature. The worst part of puberty is behind them, and the beauty and splendour of youth emerges. This is Hod, “majesty” or “splendour”, the fifth sefirah. Hod is associated with humility and gratitude (lehodot is “to thank”). In these years, the youth start to develop some inner modesty, and begin to understand a little bit about how the world works. Because of that, they are full of ideas, and full of idealism. Being social is very important, and the first real feelings of love for others is here. Fittingly, the fifth sefirah is embodied by Aaron, whom the Mishnah describes above all as a most loving person (Avot 1:12). At 20, one enters adulthood. This is the sefirah of Yesod, “foundation”. It contains the most difficult qualities to rectify, namely sexuality. Yesod is where most fail, and the Sages describe the final (and most difficult) era before Mashiach’s coming as the one where Yesod is a particular problem, as we see all around us today. There is heavy judgement in this sefirah, too, just as one begins to be judged in Heaven at age 20. Yesod is the last step before the concluding sefirah of Malkhut, “Kingdom”, where everything comes together. Yesod is therefore quite literally the last and greatest test. Most of us spend much of our lives struggling in Yesod more than in any other sefirah. Our entire generation is struggling with this sefirah in particular more than any other. Only with the proper rectification of Yesod—in a holy, wholesome, unified marriage; a true reunion of soulmates—can one enter the Kingdom. And it is only following all of this that one can ascend ever higher in the sefirot, for they do not end with these lower seven. There are three more “higher” sefirot: the mochin. First comes the pair of Binah, also called Ima, “mother”, and Chokhmah, also called Aba, “father”. On the simplest of levels, being parents is essential to achieving these rectifications. In fact, the Arizal teaches that Aba has an even deeper face (and phase) called Israel Saba, the “grandfather”. At the very end, we reach Keter, the “crown”, the highest sefirah. It corresponds to the highest soul, yechidah, and to the highest universe, Atzilut. This is the face that Daniel described as Atik Yomin, “Ancient of Days”. A holy, ancient human being whose hair is like “pure wool” (Daniel 7:9). This is a completely rectified person, a transcendent being. Such a person is like a projection of pure Godliness in this world. This is the stage of life we should all yearn to one day experience. Is there historical evidence to support the people, places, and events of the Torah? Check out our new Archaeology page! This entry was posted in Holidays, Kabbalah & Mysticism, Midrash, Personal Development and tagged Aaron, Aba, Adam and Eve, Age, Anatomy of the Soul, Ancient of Days, Arikh Anpin, Arizal, Atik Yomin, Bamidbar, Beresheet Rabbah, Chaya, Chessed, Daniel, Garden of Eden, Gevurah, Heavenly Court, Hod, Ima, Israel, Israel Saba, Jacob, Judgement, Life, Malkhut, Marriage, Midrash, Military Service, Mind, Mind-Body Connection, Mishnah, Mochin, Mochin d'Gadlut, Mochin d'Katnut, Nefesh, Neshamah, Netzach, Numbers, Parenting, Partzufim, Passover, Pirkei Avot, Rashi, Resurrection of the Dead, Ruach, Sefirot, Sha'ar HaGilgulim, Sha'ar HaKavanot, Shavuot, Splitting of the Sea, Stages of Life, Tiferet, Tikkun haBrit, Tree of Life (Sefirot), Yechida, Yesod, Zohar on May 15, 2018 by Efraim Palvanov. Should You Wear a Red String on Your Wrist? 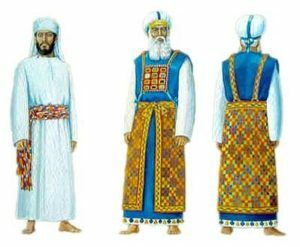 This week’s parasha, Tetzave, continues to outline the items necessary for the Mishkan, or Tabernacle, starting with the Menorah and going into a detailed description of the priestly vestments. One of the materials necessary for the holy garments is tola’at shani, commonly translated as “crimson wool”. This was a deep red fabric apparently derived from some kind of insect or worm (which is what the Hebrew “tola’at” means). The Torah speaks of this material in multiple places and in multiple contexts. 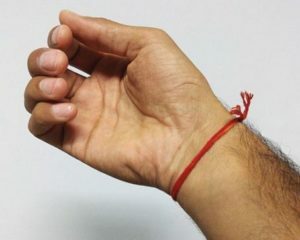 Today, wearing a “tola’at shani”-like red string on the wrist has become very popular among those calling themselves “Kabbalists” and even by secular Jews and non-Jews. What is the significance of the red fibre, and is there any real spiritual meaning to the red string bracelet? And it came to pass in the time of her labour that, behold, twins were in her womb. And in her labour, one hand emerged, and the midwife took a red string [shani] and tied it to his hand saying, “This one came out first.” And he drew back his hand, and behold, his brother came out, and she said: “With what strength have you breached [paratz] yourself?” so his name was called Peretz. And afterward came out his brother that had the red string upon his hand, and his name was called Zerach. Here, the red string is simply used to designate the firstborn. It didn’t work out as planned, for the other twin ended up coming first. The strong Peretz would go on to be the forefather of King David, and therefore Mashiach, who is sometimes called Ben Partzi. Clearly, wearing the red string wasn’t much of an effective charm for Zerach. In addition to being used in the garments of the priests and various Temple vessels, tola’at shani was employed in a number of sacrificial rituals. In Leviticus 14 we read how someone who had healed from tzara’at, loosely translated as “leprosy”, would bring an offering of two birds which were dipped in a mixture containing the red dye. From this we see that tola’at shani (or shni tola’at, as it appears here) is not necessarily the string itself, but simply the red dye extracted from the insect. 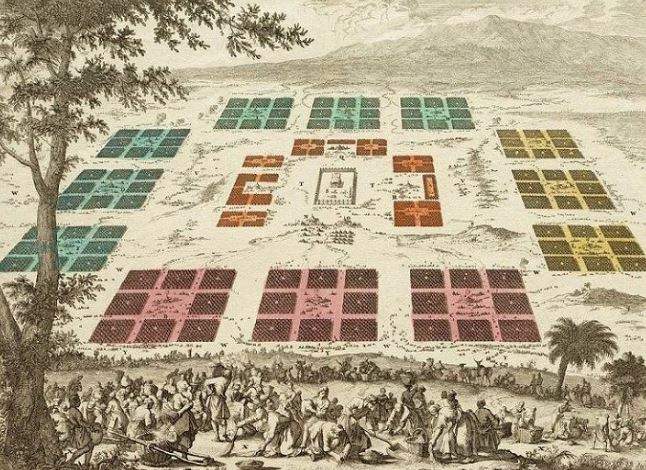 Similarly, the red dye was used in the preparation of the parah adumah, “Red Cow”, mixture (Numbers 19) which was used to purify the nation from the impurity of death. The Talmud (Yoma 67a) describes how a red string was tied to the scapegoat on Yom Kippur. Recall that on Yom Kippur two goats were selected, one being slaughtered and the other being sent off into the wilderness, “to Azazel”. This “scapegoat” had a red string attached to it, and if the string turned white the people would know that their sins had been forgiven, as Isaiah 1:18 states: “…though your sins be as scarlet, they shall be as white as snow; though they be red like crimson, they shall be as wool.” Here, then, the red string represents the sin of the people, bound to the scapegoat going to Azazel. If it turned white, it was a good sign, whereas if the string remained red it meant God was unhappy with the nation. 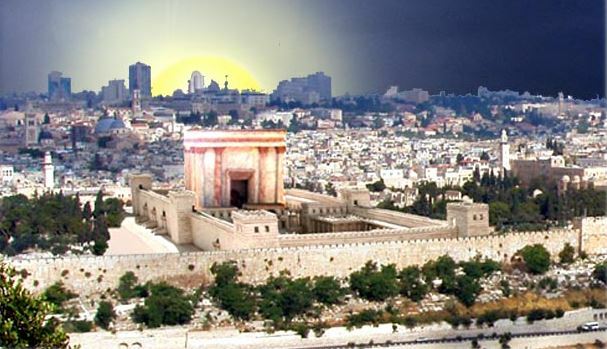 Indeed, the Talmud (Yoma 39b) states that in the last forty years before the Second Temple was destroyed, the red string never once turned white. In mystical texts, red is typically the colour of Gevurah or Din, severity and judgement. It was therefore generally discouraged to wear red. The Kabbalists often wore garments of all white, and this is still the custom during the High Holidays, a time of particularly great judgement. It was only centuries later that the Chassidic rebbe known as Minchat Eliezer (Rabbi Chaim Elazar Spira of Munkacz, 1868-1937) wrote how having a red cloth may serve to ward off judgement and severity. Another Chassidic rebbe, the Be’er Moshe (Rabbi Moshe Stern of Debreczin, 1890-1971) wrote that he remembered seeing people wear red strings as a child, but did not know why. Still, this does not appear to have been a very popular practice then, nor is it much of a custom among Chassidim now. Rather, the red string today has been popularized by The Kabbalah Centre and similar “neo-Kabbalah” movements that cater as much to non-Jews as to secular Jews. The Kabbalah Centre explains that the bracelets are made by taking a long red thread and winding it around Rachel’s Tomb seven times. The thread is then cut into wrist-size lengths, and if worn on the “left wrist, we can receive a vital connection to the protective energies surrounding the tomb of Rachel.” It is not clear where The Kabbalah Centre took this practice from. They claim that the red string wards off the evil eye. While they cite certain passages from the Zohar regarding the evil eye, there doesn’t seem to be any connection to a red string specifically. So, perhaps there is something to wearing a red string. The Zohar does not speak of any red string at all, and instead explains the mystical power of the red dye called shani. It is the dye itself that has power, as we see from the Temple rituals noted above. It is well-known that the blue tekhelet dye comes from a certain mollusc or sea snail called chilazon. From where does shani come? A female and male cochineal bug. 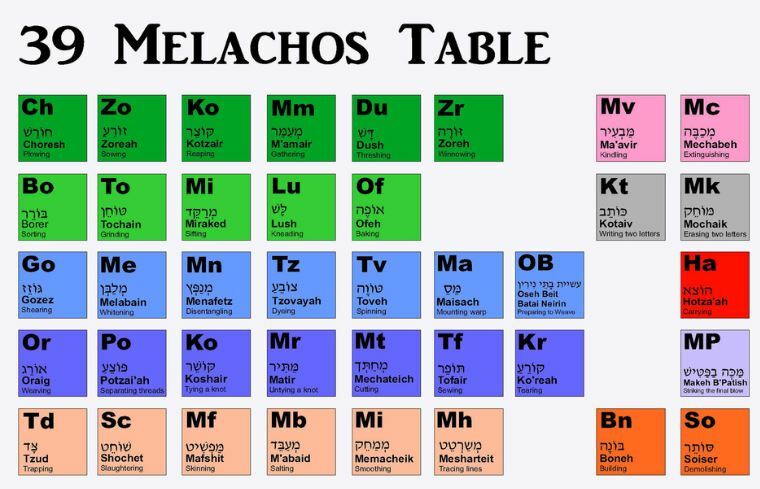 Professor Zohar Amar of Bar Ilan University researched the subject in depth and concluded that tola’at shani is similar to the cochineal insect, famous for producing the red dye carmine (E120) which is extensively used in the food industry. After a round-the-world search, it turned out that a cochineal-like insect is found in Israel as well, and grows on oak trees. 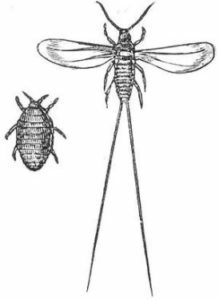 While the cochineal insect is native to South America (where most of the carmine is still produced), its Mediterranean cousin is the oak-dwelling kermes insect. Indeed, kermes was used across the Mediterranean world for millennia, being particularly prized in Greek, Roman, and medieval society. It is best known for its ability to dye wool extremely well. 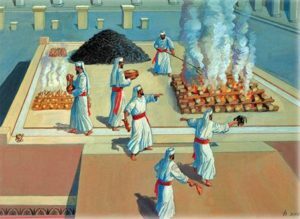 Jerusalem’s Temple Institute was convinced of the professor’s findings, and has begun harvesting the bugs and their red dye in order to produce authentic priestly vestments, as outlined in the Torah. In light of this, a genuine red string “kabbalah” bracelet—with the protective powers mentioned in the Zohar—would undoubtedly have to be made of wool dyed with kermes red. And according to the Zohar, it probably shouldn’t be worn on the left wrist at all, but instead on the right leg, the body part which the Zohar (II, 148a) states that shani corresponds to. Judaism is very sensitive about not imitating the ways of the pagans, or darkei Emori. One example of this, as we wrote in the past, is kapparot, which the Ramban (among others) called an idolatrous practice. The Tosefta (Shabbat, ch. 7) has a list of practices that are considered darkei Emori, and one of them is “tying a red string on one’s finger”. So, already two millennia ago it seems there were Jews tying red strings on their body, and the Tosefta (which is essentially equivalent to the Mishnah) forbids it. The Hindu kalava looks suspiciously similar to the “kabbalah” red string. In fact, Hinduism has a custom to wear a red string called kalava around one’s wrist in order to ward off evil. This is precisely what The Kabbalah Centre claims their red string accomplishes. Based on this alone it would be best to avoid wearing such a red string. The Lubavitcher Rebbe was one of the recent authorities who stated that the red string should not be worn due to darkei Emori. Factoring in that the red string has no basis in the Zohar or any traditional Jewish mystical text is all the more reason to stay away from this practice. This entry was posted in Jewish Law & Life Cycle, Kabbalah & Mysticism, Mysteries & Origins and tagged Azazel, Carmine, Chassidism, Chessed, Cochineal Insect, Crimson Wool, Darkei Emori, Dyes, Eshet Chayil, Evil Eye, Gevurah, God's Throne, Hinduism, Idolatry, Isaiah, Kabbalah, Kabbalah Centre, Kermes, Leprosy, Lubavitcher Rebbe, Michael, Minchat Eliezer, Mishkan, Parah Adumah, Peretz, Priestly Vestments, Proverbs, Rachel's Tomb, Ramban, Red Cow, Red String, Sacrifices, Scapegoat, Scarlet Wool, Second Temple, Tabernacle, Tamar (Genesis), Tekhelet, Temple Institute, Temple Offerings, Tetzave, Tola'at Shani, Tosefta, Tzaraat, Yesod, Yom Kippur, Yoma (Tractate), Zerach, Zohar on February 19, 2018 by Efraim Palvanov. 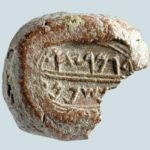 Clay Bulla of Gemaryahu ben Shaphan, dated to 586 BCE. The Books of Jeremiah (ch. 41) and II Kings (ch. 25) describe how a certain Ishmael killed Gedaliah “in the seventh month”, during what appears to be a feast day, which our Sages stated was Rosh Hashanah. The reason for the assassination is not explicitly given. 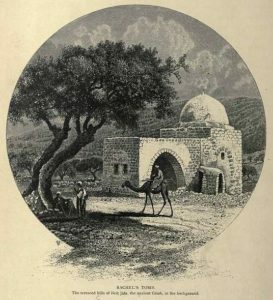 It seems Ishmael believed that if anyone should govern in Israel, it should be him since he was a member of the Judean royal family and a descendant of King David. Ishmael didn’t think the whole thing through very well. Assassinating Gedaliah immediately raised fears that the Babylonians would return to punish the Jews for smiting their appointed governor. The fearful Jewish populace thus fled to Egypt, while Ishmael himself escaped to Ammon. The tragedy was a great one not only because of the grotesque assassination of a righteous Jew by his fellow (Ishmael also slaughtered a handful of other Jews, as well as innocent pilgrims on their way to worship in Jerusalem.) Perhaps more significantly, the fleeing of the last Jews of Judea meant that the Holy Land was essentially devoid of its people for the first time in nearly a millennium. While Jews from Babylon would later come back to rebuild, they would be faced with new settlers that had since filled the vacuum in Israel: the Samaritans. This people would be a thorn at the side of the Jews for centuries to come. Worst of all, the assassination of Gedaliah is yet another example of sinat chinam, baseless hatred and Jewish in-fighting, which seems to always be the root of all Jewish problems. The Sages instituted a fast to commemorate all of these things. And the fast’s timing is particularly auspicious, as it comes during the Ten Days of Repentance when we should be focusing on kindness, prayer, and atonement. Now is the time to repair relationships and form new bonds, for families and communities to come together. For many, it also something of a “practice run” for the more famous fast that comes just days later: Yom Kippur. This brings up an important question. What exactly does fasting have to do with atonement, spiritual growth, and self-development? Aside from its well-documented health benefits, fasting brings a great deal of spiritual benefits, too. In the fast day prayers, we read how fasting is symbolic of sacrificial offerings. In the days of the Temple, people would atone by bringing an offering, shedding its blood, and watching its fat burn on the altar. In Sha’ar Ruach HaKodesh (Kavanot haTaanit), Rabbi Chaim Vital, the Arizal’s foremost disciple, explains that the sight of the animal being slaughtered would immediately inspire the person to repent. They would feel both a great deal of regret for their sin, and compassion for the animal, and would recognize that it should have been them slaughtered upon the altar. In lieu of a Temple, we fast to burn our own bodily fat, and “thin” our blood. The Arizal taught that the penitent faster is thus likened to a korban. Rabbi Vital then reminds us that the food we eat contain spiritual sparks, and even the souls of reincarnated people. While we hope that our blessings and proper intentions when eating frees these sparks and elevates them to Heaven, we are not always successful in this regard—especially when we lose sense of the meal and eat purely for physical reasons. These sparks remain with us, and can even affect our thoughts and emotions. The Arizal explains that a fast day is an opportunity to free those sparks trapped within. We avoid eating anything new, resulting in the body shedding its fat and blood, and just as these things “burn up” physically, the sparks lodged within them “burn up” and ascend as well with the help of our prayers and pure thoughts and intentions. Moreover, the difficulty of fasting breaks apart the kelipot, the spiritual “husks” that trap those holy sparks. Etz Chaim, “Tree of Life”. Note the sefirot of Gevurah and Hod on the left column. The Arizal mentions how it is good to fast not only on the six established fast days of the Jewish calendar (Gedaliah, Kippur, 10 Tevet, Esther, 17 Tamuz, and 9 Av), but on every Monday and Thursday. This is, in fact, an ancient Jewish custom that is attested to in numerous historical documents. (One of these is the Didache, an early Christian text of the 1st century CE that tells its adherents not to fast on Mondays and Thursdays because that is when the Jews fast!) The Arizal explains that Monday and Thursday, the second and fifth days of the week, correspond to the second and fifth sefirot of Gevurah and Hod. 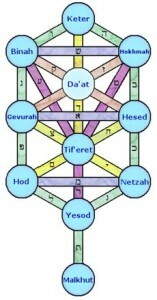 Gevurah and Hod are on the left column of the mystical “Tree of Life”, and the left is associated with judgement and severity. By fasting on these days, one can break any harsh judgments decreed upon them. The Arizal also taught that one who fasts two days in a row—48 hours straight—is likened to having fasted twenty-seven day fasts, and one who can fast three days straight has fasted the equivalent of forty day fasts. This is important because one of the most powerful fasts in Jewish tradition, which will completely purify the greatest of sins, particularly sexual ones, requires 84 day-fasts. (The number 84 comes from the fact that Jacob was 84 years old when he was first intimate, with Leah, and conceived Reuben.) Usually, this was done by fasting 40 days straight (eating only at night), followed by another 44 days (or vice versa). A person can thus accomplish the same purification by fasting both day and night for a whole week straight, from the end of one Shabbat to the onset of the following Shabbat. As this would be a personal fast, it may be permissible to consume salt and water, as the Talmud (Berakhot 35b) does not consider these to be “food”, and permits them on personal fasts only. The Arizal actually gives a tip for one who feels thirsty during a fast: they should meditate on the words Ruach Elohim (רוח אלהים). Recall that Genesis begins by telling us that God’s Divine Spirit, Ruach Elohim, “hovered over the waters”. And so, one who meditates upon this should see his thirst quickly dissipate. Ultimately, the Arizal says that Torah study is the best way to repent and expiate sins, much more so than any fast. So, a person who is not up to the task of intermittent fasting may substitute with diligent Torah study. Soon enough, there will be no need to fast at all, as the prophet (Zechariah 8:19) states: “So says Hashem, God of Hosts: The fast of the fourth, fifth, seventh, and tenth days shall be for the house of Judah for gladness, joy, and good times; for love of truth and peace.” With each passing moment, we near the time when all of these fast days—the fourth (ie. the 17th of Tammuz, in the fourth month), the fifth (9 Av, in the fifth month), the seventh (Tzom Gedaliah), and tenth (10th of Tevet) shall turn into joyous feast days. May we merit to see this day soon. This entry was posted in Holidays and tagged Ammon, Archaeology, Arizal, Babylonians, Berakhot (Tractate), Blood, Book of II Kings, Book of Jeremiah, Didache, Digestion, Din, Divine Spirit, Egypt, Fast Day, Fast of Gedaliah, Fasting, Fat, Food, Gedaliah ben Achikam, Genesis, Gevurah, Health, Hod, Ishmael ben Netaniah, Jacob, Jerusalem, Judah, Judea, Judgement, Kabbalah, Kelipot, King David, Leah, Neshamah, Prophecy, Reincarnation, Reuben, Rosh Hashanah, Ruach Elohim, Sacrifices, Salt, Samaritans, Sha'ar Ruach haKodesh, Shaphan, Sinat Hinam, Soul, Sparks, Temple, Ten Days of Repentance, Tree of Life, Tzom Gedaliah, Water, Yigal Shiloh, Yom Kippur, Zechariah on September 24, 2017 by Efraim Palvanov. This week’s Torah portion is Emor. It begins with a set of priestly laws before delving into a long exposition about the Jewish holidays. The Torah lists a total of seven holidays, starting with Shabbat, then Pesach, Shavuot, Rosh Hashanah, Yom Kippur, Sukkot, and Shemini Atzeret. Other holidays like Chanukah and Purim were instituted by the Sages, based on later historical events and references in the Tanakh. 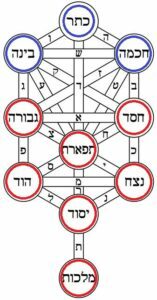 Etz Chaim, “Tree of Life”, showing the upper sefirot (Keter/Da’at, Chokhmah, and Binah, known as the Mochin), and the seven lower sefirot that follow. The Torah’s arrangement of holidays, and their meanings, immediately call to mind the seven lower mystical sefirot, or middot. Pesach is all about God’s salvation and the liberation of the Jewish people, tying into the first sefirah, Chessed, or “kindness”. This sefirah is associated with water, and the Pesach narrative both begins and ends with the theme of water: the Israelite newborns in the Nile, and the Egyptian soldiers in the Red Sea, with the Israelites themselves passing through the raging waters unharmed. Six months later, opposite Pesach, is the holiday of Rosh Hashanah. While the former marks the start of spring, the latter ushers in the time of autumn. Whereas Pesach is about freedom and kindness, Rosh Hashanah is about judgement and repentance. Not surprisingly, Rosh Hashanah corresponds to the sefirah opposite Chessed, called Gevurah, or “restraint”, and more commonly referred to as Din, “judgement”. This sefirah is associated with fire, like the purifying flames of God’s crucible evoked during this time. The third sefirah is Tiferet, “beauty” or balance, and is commonly referred to as Emet, “truth”. This corresponds to the holiday of Shavuot, which commemorates the revelation of truth and the giving of the Torah at Sinai. The Talmud (Shabbat 88a) famously states that God gave a three-part Torah to a three-part people (Israel, Levi, Kohen), through the third (Moses, a third-born child), on the third day (meaning either on a Tuesday, or after the required three days of purification) of the third month (Sivan). A mystical reading of the Talmud might add: corresponding to the third sefirah (Tiferet). Tiferet is associated with wind, or spirit (the Hebrew terms for “wind” and “spirit” are the same), referring to the divine spirit that rested upon the entire nation at Sinai. The fourth and fifth sefirot, Netzach (“Victory” or persistence) and Hod (“Splendour” or gratitude), are always discussed together. The Kabbalists use these energies as symbols representing twin pairs such as a pair of legs, kidneys, or even testes and ovaries. They represent the twin forces of light and electricity, highly interrelated from a scientific perspective, and both traveling at the same incredible speed (300,000 km/s). When it comes to the holidays, Netzach and Hod are the two interrelated holidays of Sukkot and Shemini Atzeret. Then comes Yesod, “foundation”, referring to righteousness and in particular, sexual purity. This is undoubtedly Yom Kippur, the day of atonement and purification. Lastly, the seventh sefirah, Malkhut or “kingdom”, is the holiday that we have every seventh day. Shabbat is referred to as the Sabbath “Queen”—fitting for a sefirah representing kingdom. Malkhut symbolizes fulfilment and completion, and as we read every Friday night, Shabbat is the day that God completed His creation, and in which we, like God, find fulfilment. Right after the holiday passage, the parasha records God’s instructions for lighting the Temple Menorah. 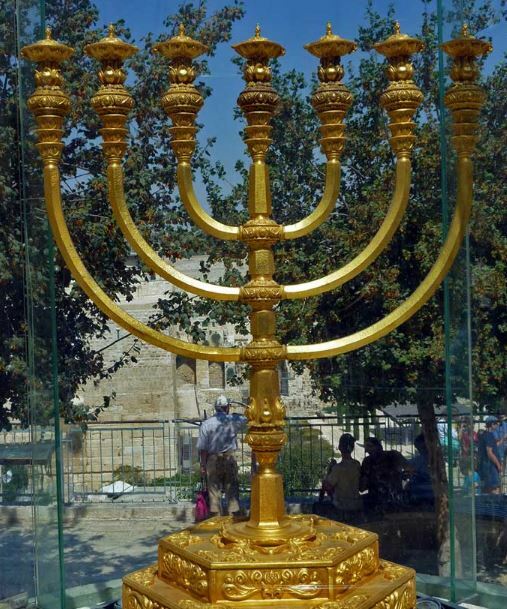 The Menorah had seven branches, once again corresponding to the seven lower sefirot. Elsewhere, the Torah tells us in detail the design of the Menorah, and we see that it was composed of 22 cups shaped like almond flowers, with 11 knobs for buds and 9 flower blossom ornaments. Together with the seven lamps, that makes a total of 49 components. Meanwhile, each of the seven sefirot is itself further composed of seven inner sefirot, making a total of 49 parts. These correspond to the 49-day counting of the Omer, with each of the seven weeks representing a sefirah, and each of the seven days of each week representing one sefirah within a sefirah. Because of this, it is customary to read Psalm 67 after reciting the counting of the Omer each night. This psalm in particular is said to have immense spiritual power. 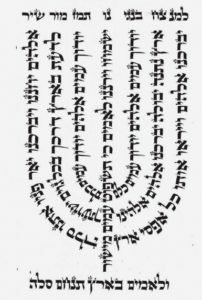 Rabbi Chaim Yosef David Azulai (1724-1806), better known as the Chida, wrote in his book Midbar Kedumot that God revealed the words of this psalm to King David in the shape of a menorah, emblazoned upon a golden shield. 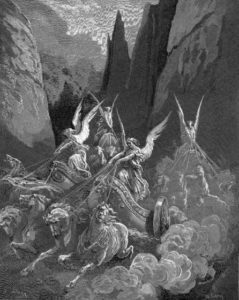 David engraved the image upon his own shield, causing his enemies to fall before him. The psalm itself requests that people will grow to know God, thank Him, and walk in His ways, and that in turn, God will bless us and shine His countenance upon us. Ultimately, this is the purpose of the Sefirat haOmer period. It is a time of refinement, growth, and personal development. 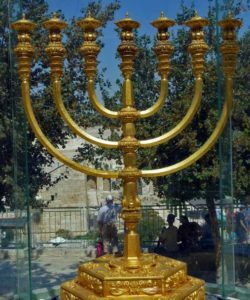 The Menorah is therefore a most appropriate image, as its seven branches are said to represent the seven orifices of the face (eyes, ears, nostrils, and mouth), and the seven major parts of the body (arms, legs, head, torso, and reproductive organ). Our task is to purify all of these aspects of ourselves, so that our bodies become holy and our souls shine forth like the radiant light of the Menorah. 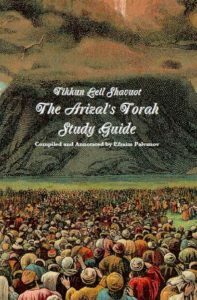 Make your Shavuot night-learning meaningful with the Arizal’s ‘Tikkun Leil Shavuot’, a mystical Torah-study guide, now in English and Hebrew, with commentary. This entry was posted in Holidays and tagged Chessed, Chida, Emor, Gevurah, High Holidays, Hod, Holidays, Kabbalah, King David, Malkhut, Menorah, Netzach, Passover, Psalm 67, Psalms, Rosh Hashanah, Sabbath Queen, Sefirat HaOmer, Sefirot, Shabbat, Shabbat (Tractate), Shavuot, Shemini Atzeret, Sukkot, Temple, Tiferet, Tree of Life (Sefirot), Yesod, Yom Kippur on May 8, 2017 by Efraim Palvanov.